Swirling around the young star Elias 2-27 is a stunning spiral-shape pinwheel of dust. 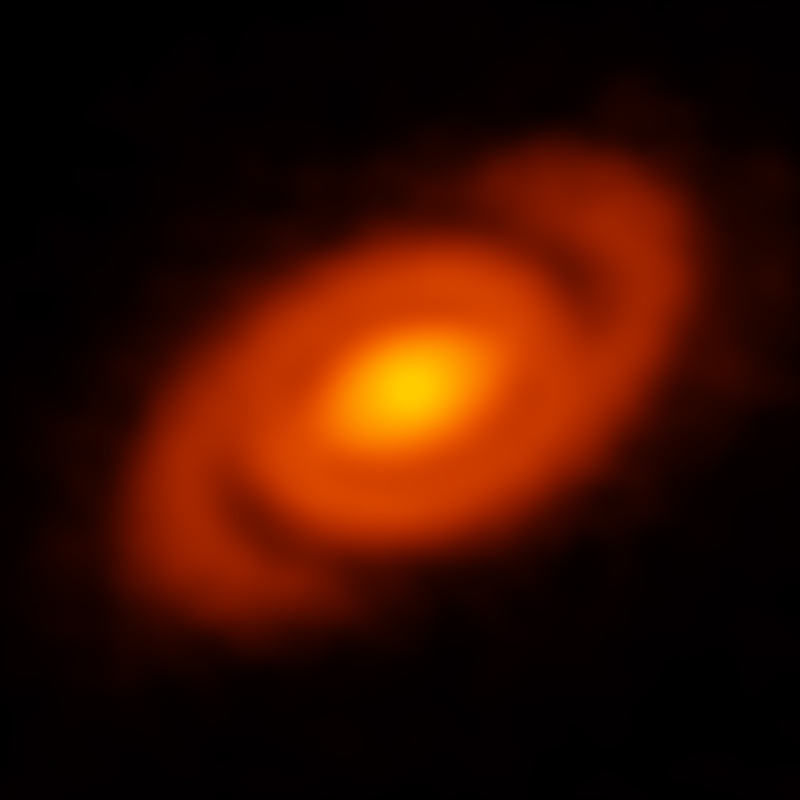 This striking feature, seen with the Atacama Large Millimeter/submillimeter Array (ALMA), is the product of density waves – gravitational perturbations in the star’s protoplanetary disk that produce sweeping arms reminiscent of a spiral galaxy, but on a much smaller scale. 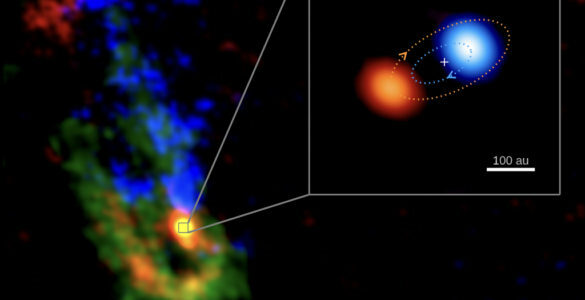 “These observations are the first direct evidence for density waves in a protoplanetary disk,” said Laura Pérez, an astronomer and Alexander von Humboldt Research Fellow with the Max Planck Institute for Radio Astronomy in Bonn, Germany, and lead author on a paper published in the journal Science. Previously, astronomers noted compelling spiral features on the surfaces of protoplanetary disks, but it was unknown if these same spiral patterns also emerged deep within the disk where planet formation takes place. ALMA, for the first time, was able to peer deep into the mid-plane of a disk and discover the clear signature of spiral density waves. Nearest to the star, ALMA found a familiar flattened disk of dust, which extends past what would be the orbit of Neptune in our own solar system. Beyond that point, ALMA detected a narrow band with significantly less dust, which may be indicative of a planet in formation. Springing from the outer edge of this gap are two sweeping spiral arms that extend more than 10 billion kilometers away from their host star. Finding density waves at these extreme distances may have implications for planet-formation theory, Pérez notes. 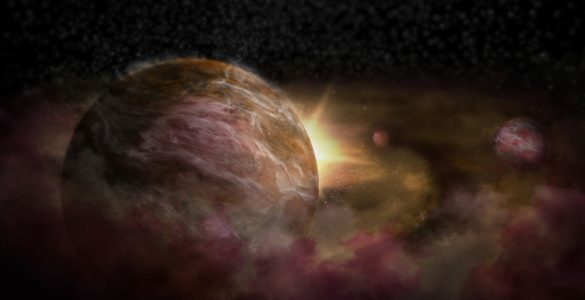 The standard picture of planet formation begins with small planetesimals coming together under gravity. In the outer reaches of a protoplanetary disk, where there is a dearth of planetesimals, disk instabilities may also lead directly to the formation of a planet. 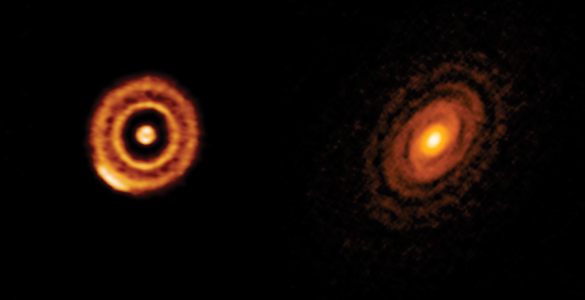 ALMA’s detection of spiral density waves may be evidence that such a process is taking place. Elias 2-27 is located approximately 450 light-years from Earth in the Ophiuchus star-forming complex. 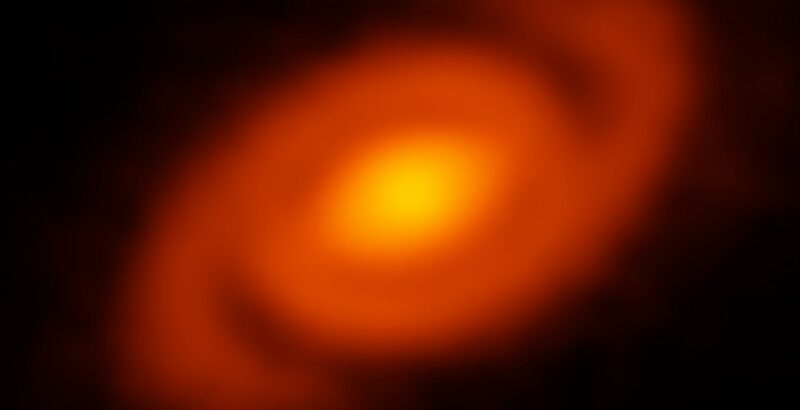 Even though it contains only about half the mass of our Sun, this star has an unusually massive protoplanetary disk. 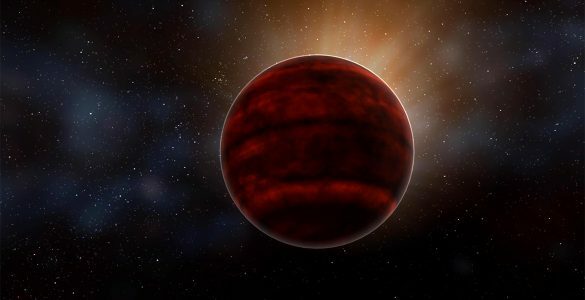 The star is estimated to be at least one million years old and still encased in its parent molecular cloud, obscuring it from optical telescopes. “There are still questions of how these features form. 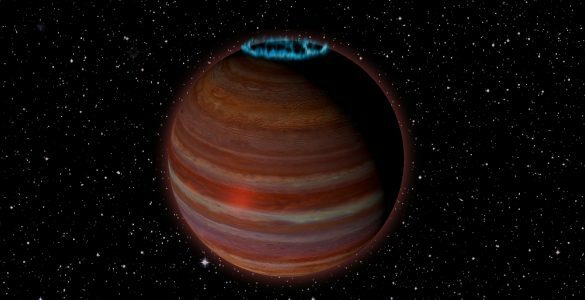 Perhaps they are the result of a newly forged planet interacting with the protoplanetary disk or simply gravitational instabilities driven by the shear mass of the disk,” said Andrea Isella, an astronomer at Rice University in Houston, Texas, and co-author of the paper. This research is presented in a paper titled “Spiral density waves in a young protoplanetary disk” by L.M. Pérez et al., published in the journal Science. The team is composed of L. Pérez (A. v. Humboldt Fellow at the Max Planck Institute for Radio Astronomy, Bonn, Germany), J. Carpenter (Joint ALMA Observatory, Santiago, Chile), S. Andrews (Harvard-Smithsonian Center for Astrophysics, Cambridge, Mass. ), L. Ricci (Harvard-Smithsonian Center for Astrophysics, Cambridge, Mass. ), A. Isella (Rice University, Houston, Texas), H. Linz (Max Planck Institute for Astronomy, Heidelberg, Germany), A. Sargent (Caltech, Pasadena, Calif.), D. Wilner (Harvard-Smithsonian Center for Astrophysics, Cambridge, Mass. 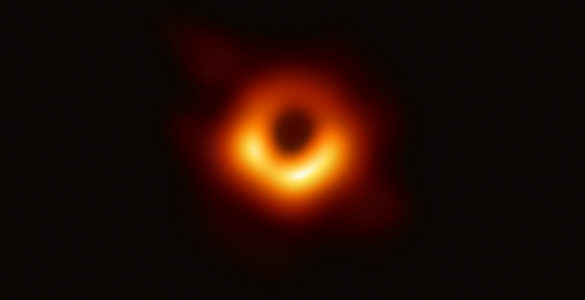 ), T. Henning (Max Planck Institute for Astronomy, Heidelberg, Germany), A. Deller (The Netherlands Institute for Radio Astronomy, Dwingeloo), C. Chandler (National Radio Astronomy Observatory, Socorro, N.M.), C. Dullemond (Heidelberg University, Germany), J. Lazio (Caltech, Pasadena, Calif.), K. Menten (Max Planck Institute for Radio Astronomy, Bonn, Germany), S. Corder (Joint ALMA Observatory, Santiago, Chile), S. Storm (Harvard-Smithsonian Center for Astrophysics, Cambridge, Mass. ), L. Testi (European Southern Observatory, Garching, Germany), M. Tazzari (European Southern Observatory, Garching, Germany), W. Kwon (Korean Astronomy and Space Science Institute, Daejeon), N. Calvert (University of Michigan, Ann Arbor), J. Greaves (Cardiff University, U.K.), R. Harris (University of Illinois, Urbana), L. Mundy (University of Maryland, College Park). 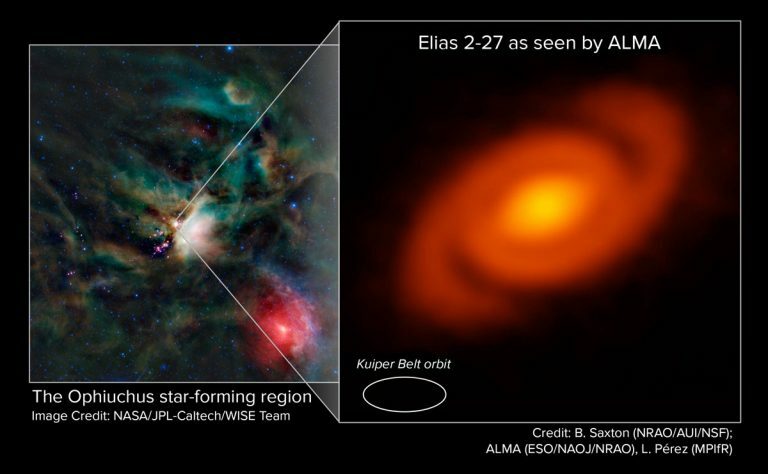 ALMA discovered sweeping spiral arms in the protoplanetary disk surrounding the young star Elias 2-27. This spiral feature was produced by density waves – gravitational perturbations in the disk. ALMA peered into the Ophiuchus star-forming region to study the protoplanetary disk around the young star Elias 2-27. Astronomers discovered a striking spiral pattern in the disk. 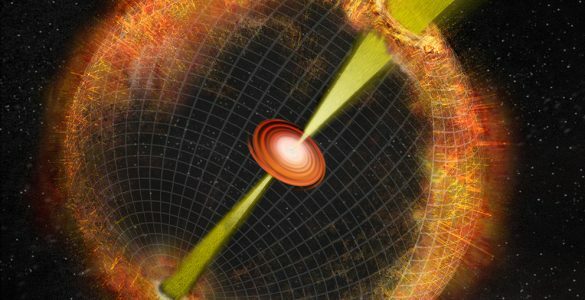 This feature is the product of density waves – gravitational perturbations in the disk.